Over the summer here in New Jersey, we saw some of the highest prices ever for scrap metal. Cast Iron was bringing 10 cents a pound at a yard that was less than 5 miles from my house. No. 1 copper was bringing $3.40, and die cast was bringing 67 cents. I took advantage of the prices and cleaned the bone yard out. I scrapped out a few Mattison moulders, a bunch of old jointers, a few band saws, and some other assorted junk I had laying around. Trashing these items made perfect sense, and I had no second thoughts about them. There were a few other machines that I had to think long and hard about before sending them off to the shredder. 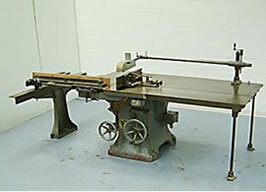 One of them was an Oliver Universal Saw Bench. I found this machine from an old sash shop in Pawtucket, Rhode Island. 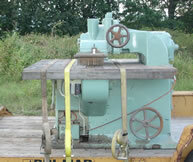 I bought the saw because I needed the fence and miters for an Oliver 88 that I’m thinking about restoring. I figured I’d take the parts I needed and sell the rest off for parts. I had the saw advertised at on a few sites. The asking price was $200. After a month, I had no takers. I did get a few offers on some of the parts. That was back in May when the scrap CI price was peaking. One day, I just decided to strip it and drag the rest out to the scrap yard. The funny thing is that I got $200 from the scrap yard, and another $150 for the parts I sold. I had a similar situation with a Fay & Egan No. 999 Lightning straight line rip saw. I found this machine in an old cabinet shop in Brooklyn, New York. This saw was in perfect operating condition. I advertised it in the on-line forums for several months at $1000. I had no takers for the whole saw, but I got some offers on the feed chain, the kickback fingers and the fence. Once again, I stripped the saw and sent the remainder to the shredder. The saw brought $700 in scrap. The parts I sold brought another $1225. I don’t think that either of these saws was a great loss to world of machinery collectors. Let’s face it, the Oliver USB is an archaic design and would be of little value as a production machine. Sure, it would have made a great museum piece, but I think there are enough of those out there already. 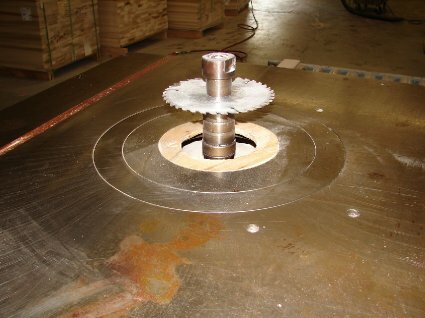 It’s also worth noting that these tilt-top table saws are downright dangerous. The F&E rip saw was perfectly functional, but it’s really hard to justify owning a saw that’s designed for high volume production work if you can’t find any parts for it. These 999’s are scarce. That’s why the parts brought a premium price. What does give me pause is the depressed price of machinery. With table saw prices falling well below $500, it’s getting to the point where they are worth more in scrap than as working machines. The depressed prices will make the collectors happy for awhile, but eventually, the scrap guy will be the only one bidding against them for these old machines. With the healthy market appetite for scrap metal, this trend will likely continue for some time. This especially true when you consider that the scrap dealers are more motivated than the collector’s. I’ve heard alot of talk about saving these old machines. Some of that talk has even been elevated up to a discussion of moral obligation. That’s all well and good if you’re willing to put your money where your mouth is. Otherwise, it’s just more heckling from the cheap seats. For my part, I save the machines I deem to be worthy of the effort, but I now find myself looking at old compressors and other junk while I’m out looking at woodworking machinery. I even bought two complete chip board extrusion lines this summer. They weighed in at 85,000LBS each. Guess where they ended up. Nice site! I’ll have to add it to my list of tool sites. I think one variable that was excluded from your post was location. Were you to live on the west coast I think that you would see a much higher resale market for the old machines, especially Olivers. Out here that name is like gold and with very few factories, etc the supply is much smaller than the demand. Too bad that there are all those miles in between. Again, great site and nice post. I look forward to your future writings. scrap those mattison 276’s w/o first getting the appropriate clearances from the authorities. you obviously didn’t mind going against the usual chain of command in these cases…..
and when are you gonna name this freakin’ site???? or some other like that….